Registration for the SMEI 2016 Conference now open! 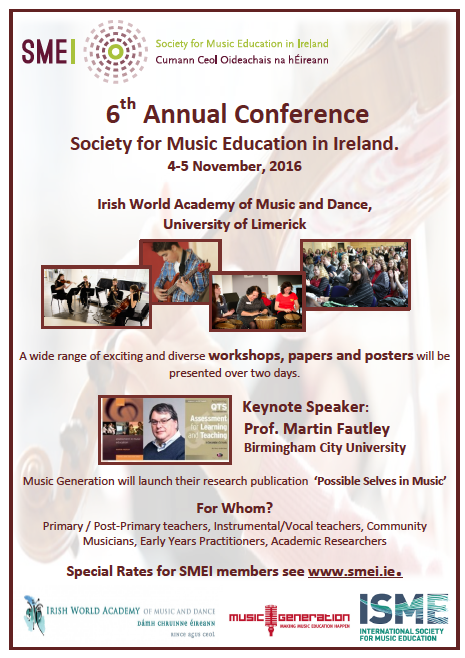 The CFP for the 6th Annual Conference of the Society for Music Education in Ireland has now closed. 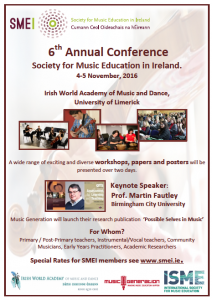 All are invited to join us for the 6th Annual Conference of the Society for Music Education in Ireland (SMEI), this year hosted by the Irish World Academy of Music and Dance, The University of Limerick November 4-5th 2016. We have several options for registration, for SMEI members, non-members, waged, and student/unwaged. To register as a current member, please select the ensure your SMEI membership is up to date from 1 September 2016. Follow our Twitter #SMEI2016 & Facebook event page for more details. The approximate cab fare is €45 (includes all passengers in the taxi). The bus fare from Shannon airport is €5 one-way with a private coach company (JJ Kavanagh), which drops passengers at the entrance to the UL Campus (25-minute walk to the Cappavilla Village Apartments) or the Stables (a 20-minute walk to the Cappavilla Village Apartments). See www.jjkavanagh.ie for further information. The public bus service with Bus Eireann is more expensive and runs from Shannon airport to Limerick City (€8.40 one-way, €13.20 round-trip), with a second bus (€2 one way) from the city centre to the UL. eireagle offer 8 coaches daily from Dublin Airport to Limerick City. Please see the following link for further information www.eireagle.com (Please ask the driver to be left off at the Hurlers/Castletroy bus stop, as this is the closest stop to campus). Citylink and Bus Eireann both offer limited services from Cork Airport to Limerick city. Please see http://www.citylink.ie/timetables and www.buseireann.ie for further information. Limerick is also the gateway to Ireland’s Wild Atlantic Way. The Wild Atlantic Way on Ireland’s west coast leads you through one of the world’s most dramatic coastal landscapes, a landscape on the edge of Europe that has shaped the development of its people, communities and settlements, a landscape that has inspired its own particular language, literature, art, song and dance. It’s a place of many natural features – seascapes, sea-life, cliffs, mountains, glens, loughs, trails and pathways. It’s a place to experience nature at its wildest, a place to explore the history of the Gaels and their religion; a place to experience great events, great food and drink, great music and the craic. or contact the Tourist Information Centre, located on O’Connell Street in the city centre. The centre is open all year round, Monday – Saturday and is the ideal starting point for visitors to the city. Telephone: +353 61 317 522.